Tyga, who's well-known for being the on-again, off-again boyfriend of reality star Kylie Jenner, is even more notorious for his troubling love of big cats - especially his namesake tigers. Recently, the 26-year-old rapper got slammed by Bobbi Brink, founder and director of Lions, Tigers & Bears, a big cat and exotic animal rescue in Alpine, California, for not sparing funds to help care for his former pet tiger, now named Maverick, who now resides there - and is apparently a pricey resident, TMZ reported. Brink could not be reached for comment. Tyga found himself in the midst of a scandal back in 2014, when an anonymous tip sent to the California Department of Fish and Wildlife said that a young tiger lived in the backyard of Tyga's home in southern California, NBC Los Angeles reported. Sadly, the U.S. suffers from a backyard tiger epidemic, with more tigers in captivity in America than are left in the wild. When officials went to the home to follow up on the tip, no tiger was discovered. Officials waited for hours until Tyga returned home before questioning him about the tiger. The rapper told officials that the 7-month-old male Bengal tiger was taken to an animal shelter earlier that day - lest he face fines and and potential jail time for the illegal ownership of an exotic animal. Maverick was rescued from the shelter and transported to Lions, Tigers & Bears, where he appears to be happy and in good health. Sources reportedly close to Tyga told TMZ that he didn't realize the tiger was illegal to own and gave him up as soon as he found out. ... and lying on the floor of what appeared to be a recording studio with Tyga himself. In many of the photos, the tiger also wore a leash. 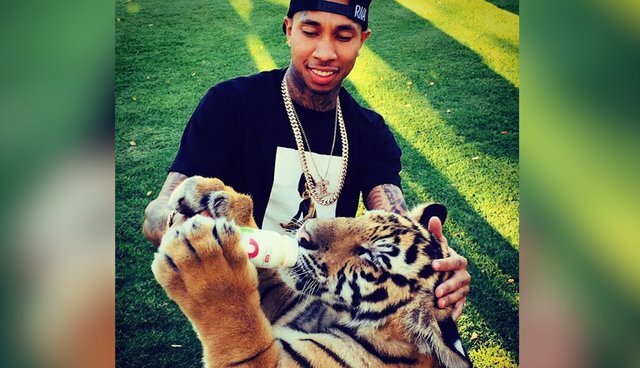 Despite this debacle, it seems Tyga still hasn't learned his lesson about casually mingling with wildlife. ... and petting a tiger cub. This was far from Tyga's first trip to Dubai that involved exotic wildlife - in an older Instagram post, he shared a video where he further agitated an already visibly upset lion locked in a cage. The problem with Tyga - and other celebrities like Justin Bieber who party with tigers - flaunting their up close and personal adventures is that they face the very real risk of sending the wrong message to their large fanbases: that petting, bottle-feeding and putting leashes on these animals is okay, when the reality isn't nearly as cute as filtered photos make them appear. In order to make animals like tigers tame enough to handle such close contact with humans, they're stolen from their mothers as cubs, beaten and even drugged. "If you can hug, ride or take a selfie with a wild animal, chances are cruelty is involved - so don't do it," Jan Schmidt-Burbach, a World Animal Protection (WAP) senior wildlife and veterinary adviser based in Bangkok, told The Dodo early last month. There are so many ways to enjoy wildlife without hurting the animal involved or putting humans at risk with such interactions - see how here.